A few weeks ago, The Palm in Charlotte reached out to me to try their new lunch menu. Lunch has been on their menu in the past, but their new Three Course Power Lunch is brand spanking new. 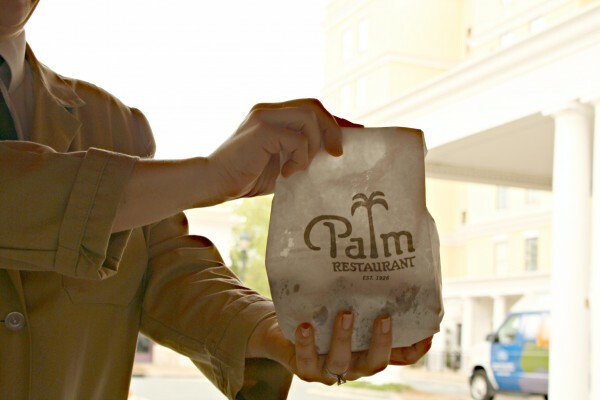 Honestly, up until this point, I had never tried The Palm. I don’t frequent chain restaurants very often, and it’s down in Phillips Place which I rarely think of when we’re picking a restaurant. 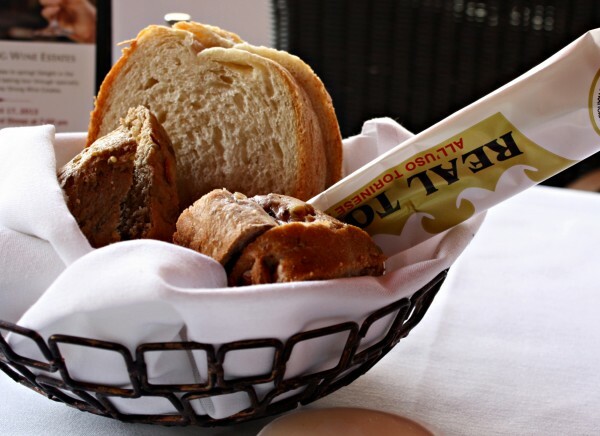 I invited my friend Amy along for the ride, who loves trying new food as much as I do, and we immediately jumped into the bread basket set before us. Their nutty wheat bread (front of the basket) was warm and delicious. Sometimes I pass on bread because it’s “just okay”, but this bread was chewy, soft in the center, and just right — a definite problem when you’re trying to save room for lunch. 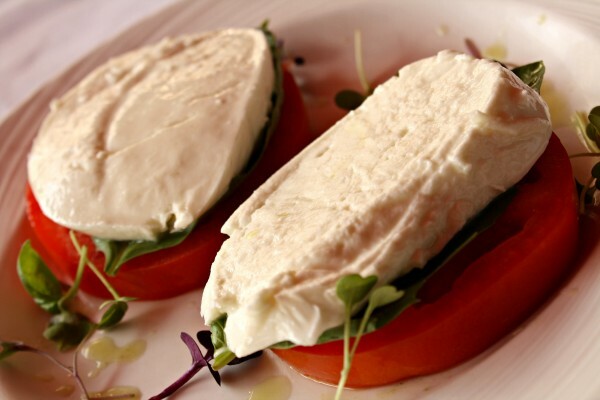 I chose the half sandwich half salad option and started out with a caprese salad — one of my favorite salads ever at any restaurant. Rather than dousing the salad in balsamic, The Palm sends out two glass bottles of balsamic vinegar and olive oil so you can dress your salad any way you like. Next, out came our main course. Amy ordered this beautiful salad. The salad was massive (you’ll find it under the Big Salad portion of the menu) and looked like something I would order, if I wasn’t avoiding raw fish at the moment. I feel like lobster on any menu in NC is somewhat of a rarity, especially on a lunch menu so I went with the Lobster BLT. Also, if you’ve been following any of my pregnancy posts, you know BLTs have been high on my list of cravings. My eyes went immediately to this sandwich. The Goddess dressing (which is one of my favorite dressings) was icing on the cake. This sandwich was delicious and I loved that the dressing wasn’t too powerful. Amy says that she’s tried a sandwich like this before (not at The Palm) and the bacon overtook the taste of the lobster, which is what you’re really paying for when you order anything with lobster. 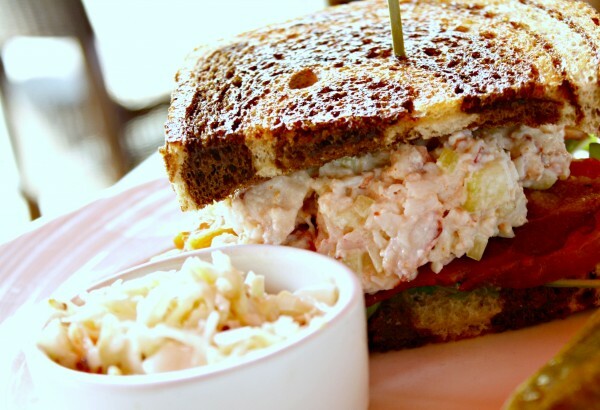 Not the case with this sandwich; I could definitely taste the lobster in every bite. This sandwich was just what I wanted. About halfway through our meal, we discovered that we hadn’t ordered off the Power Lunch menu, which is really what they wanted us to try. So the manager came out to explain that we would be getting a few more courses to our meal. Amy and I decided to box up the rest of our lunch so we could attempt to taste the rest of the food being brought out to us. The Power Lunch is a three course lunch, something you might usually get for dinner. We skipped the salad portion and went straight to the entrees, but first The Palm wanted us to try the crab cake sandwich. I rarely order crab cakes at a restaurant because my mother-in-law has completely spoiled me. Out on the coast, we throw out crab pots right off their pier and then she uses the fresh crab meat to make burger-size crab cakes that has hardly any breading and fries them in a bit of extra virgin olive oil. They’re amazing. 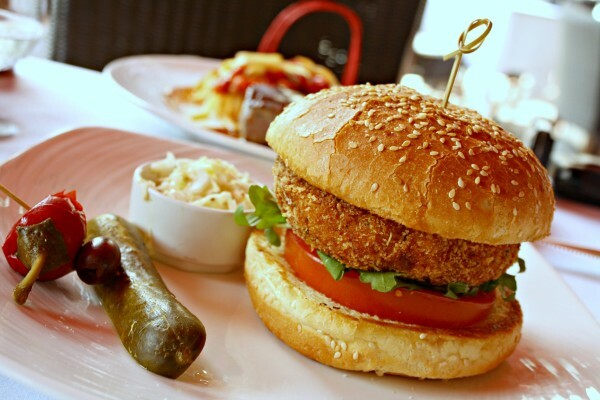 That beings said, I really enjoyed the crab cake sandwich served to us at The Palm. It was a generous portion of crab cake, but it was crispy because after making the crab cake, they roll it in panko bread crumbs before frying it. Not too “bread-y” and a generous portion size means this sandwich is worth ordering in my book. The first entree to come from the Power Lunch menu was their chicken parmesan. I’m not a heavy pasta dish kind of girl, but I enjoyed the few bites I had of this meal. Although it’s hard to tell in the picture, this dish is made up almost entirely of chicken with only a side portion of pasta. Most restaurants go easy on the pricier protein and load you up with cheaper pasta. 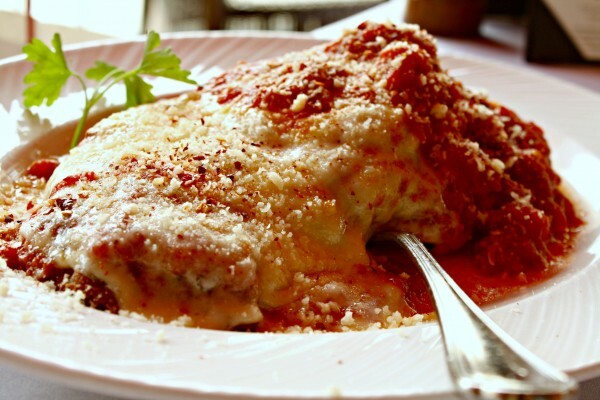 I can’t see chicken parmesan without thinking of my brother Wess who orders chicken parmesan at every single restaurant possible. He’ll order it at a Mexican restaurant if they have it. He would have loved this dish. Our second and final entree from the Power Lunch was the filet mignon. This was served with toast topped with peppers and onions. The filet was cooked perfectly and just happens to be my favorite cut of steak. 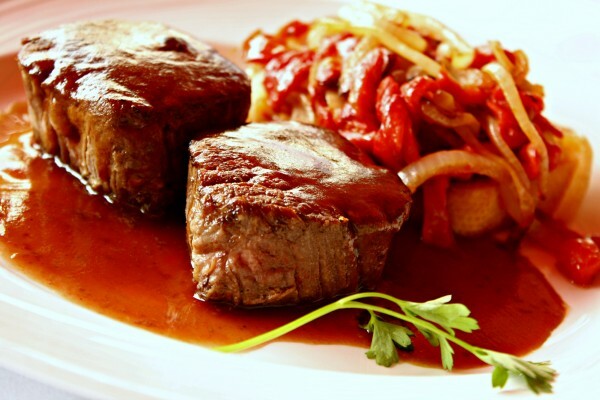 Filet mignon is also something I’m picky about and only order it at good steak houses where I know it will be cooked perfectly. I would definitely order the filet at The Palm as well, based on my experience here. 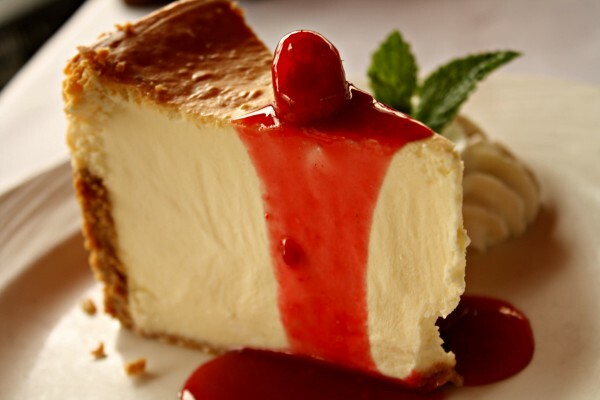 Next up was dessert, starting with cheesecake. The cheesecake was rich and creamy and I really liked that they topped it with maraschino cherry juice but only two cherries. I actually like the juice but not the actual cherries (I prefer black cherries). Our second dessert was key lime pie. 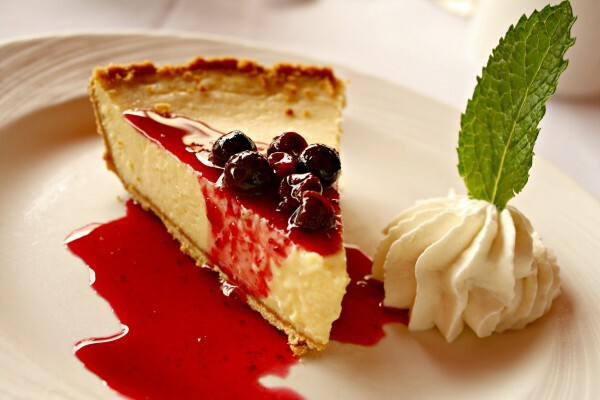 Key lime pie is one of my very favorite desserts, especially during warmer weather. I have never thought to top with blueberries and really enjoyed the pairing. Our final dessert is not on the Power Lunch menu, but you can order it any time. I just love food that requires a presentation. 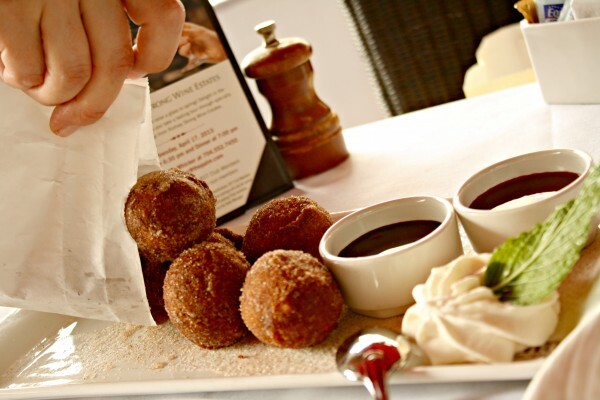 The doughnuts come in a bag with cinnamon and sugar, which the server shakes just before emptying the contents of the bag onto your plate. Although I was stuffed to my gills, I couldn’t leave without dipping a doughnut into the chocolate sauce. These rivaled my love for the key lime pie, and that’s saying something. 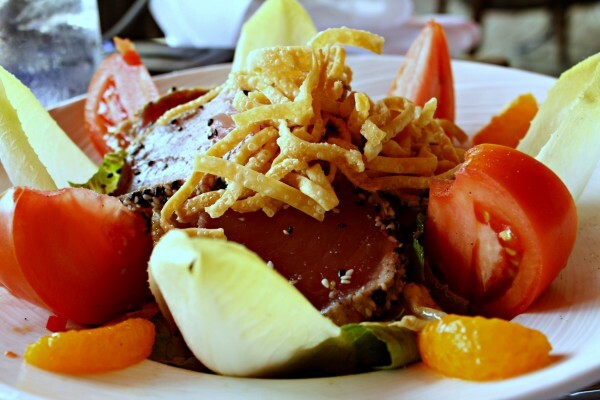 The Power Lunch at The Palm is for someone who wants to really do it up big for lunch. It would be perfect for a client lunch or to celebrate a special occasion. The portion sizes are very generous and the food is delicious. I’ll definitely think about The Palm the next time I’m throwing around restaurant ideas, especially for lunch. *My pride will not let me end this post without pointing out that while Amy and I tasted everything served to us, we did not in fact eat all of this food. We had leftovers for days. While my belly is much bigger nowadays, my appetite does not have super powers. **As a guest of The Palm, this meal was provided to me free of charge. However, the opinions expressed here are 100% my own. 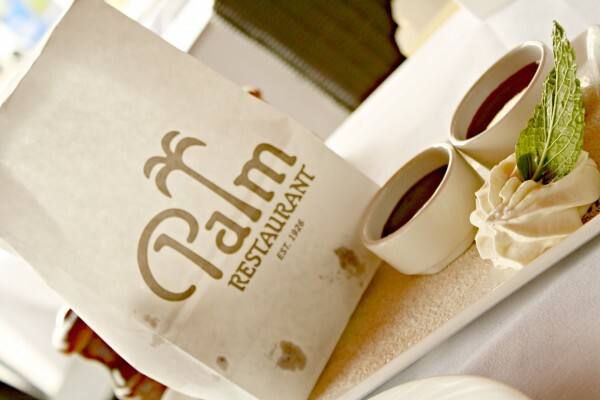 Have you visited The Palm?